Boreas, the god of the north-wind, abducts the Athenian princess Oreithyia as his bride. 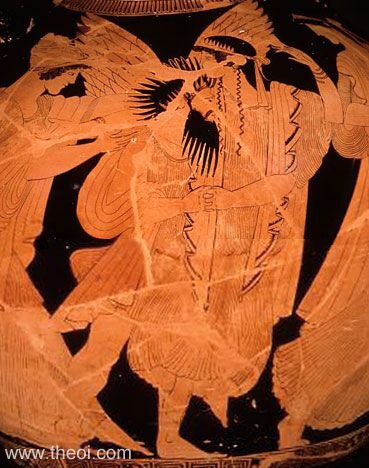 The god is depicted as a winged man with spiky hair and beard who grasps the girl about the waist. The pair are flanked by her sisters, Pandrosos and Herse, one of whom reaches out to grab her. A third sister (not shown) reports the event to their father King Erechtheus and the elderly, retired king Cecrops.